Robert Earl Keen Wishes You a "Merry Christmas from the Fam-O-Lee"
Magic is coming to Chattanooga this Christmas in the form of Robert Earl Keen’s all new, expanded “Fam-O-lee Back to the Country Jamboree!” This fan-favorite Christmas tour adds 19 new stops to the year’s already robust schedule which will kick off in Chattanooga. Often referred to as the Jimmy Buffet of Christmas, Robert Earl Keen will bring visions not only of sugar plums, elves and maybe a cow or two to the Tivoli Theatre on November 27, but also the spirit of country music’s greatest artists, both past and present along with some of Keen’s greatest hits. We had the pleasure of interviewing Mr. Keen about his upcoming show in Chattanooga, his recent hurricane relief headline performances, and his upcoming tour alongside Lyle Lovett for George Strait&apos;s "Strait to Vegas" concert series. 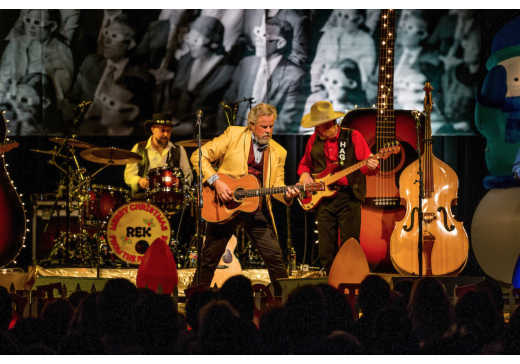 Read on to learn more about some of Robert Earl Keen&apos;s personal favorite holiday traditions, and mark your calendar for this all-ages holiday show. Merry Christmas from the Fam-O-Lee! What’s your favorite thing about playing in Chattanooga? I like the town; I’ve always liked Chattanooga, and I only play at places that I like. How would you describe Tennessee music? That’s an interesting question. Tennessee’s music is really authentic. It’s almost gospel infused, with a backcountry sort of sound that people have forged over the years. It has elements of bluegrass and sounds like country music from the sixties, during the heyday of country music, combined on top of Methodist hymnal melodies. It’s authentic, sparse and simple. What you see is what you get. What’s your favorite thing about Tennessee? The seasons. I lived in Nashville for two years, and each season clearly shows what time of year it is. I love the countryside, especially the eastern Tennessee hills and the Tennessee River. The middle part of Tennessee between Nashville and Chattanooga, near McMinnville, that part is fabulous – it’s as beautiful as anything in the country...to see that kind of old farm country, it’s rare. Is there any reason why you chose Chattanooga as the kick off city for this tour? This tour has been going on for six years now. It’s been my dream to take it out of Texas; in fact, the idea was to find a spot that was far from Texas, and Chattanooga came up first. What can people expect from this show? People can expect thinking about what a wonderful thing Christmas is...the spirit of it. The show is fun and colorful. It has the largest can of fake snow and crazy set pieces. “Back to the Country Jamboree” was a Neil Young song, a country rock song. We all dress up in character, bringing the spirit of Christmas to Chattanooga. Can you tell us about the surprises we should expect? In some ways, the show is always a surprise, even to us. Prior to your holiday tour kick off, you’ve been busy helping in hurricane relief efforts. You headlined the Oct. 21 “Deep From The Heart Concert” hosted by former living U.S. Presidents performing alongside Alabama, Cassadee Pope, Lady Gaga and more. Previous to the “Deep From The Heart” concert, you entertained fans alongside George Strait, Lyle Lovett, Miranda Lambert and Chris Stapleton at the “Hand in Hand” benefit that has since raised over $55 million for hurricane relief. Can you tell us a little bit more about your recent involvement with these hurricane relief efforts? I’ve always been someone who puts a ton of time into my work. I’ve even negotiated my own contracts just so I could get on stage. I’ve worked for everything I’ve ever gotten. When it comes to these recent hurricane relief shows, people just called me up, and I got flat lucky. These were shows I couldn’t buy my way onto the stage. George Strait called me personally to play for San Antonio, along with Lyle Lovett, Chris Stapleton and Miranda Lambert. The music was fantastic, and everyone’s heart was in the right place. As for the “Deep From The Heart” concert, they asked if I would play, and I said sure. And I got to meet 5 of our U.S. Presidents, which is very exciting for me, since I love history. It was just announced that you will take the stage alongside Lyle Lovett at George Strait’s “Strait to Vegas” concert series in Las Vegas in 2018. Can you tell us more about that series? Your “No. 2 Live Dinner” album will be rereleasing on vinyl this year and your "Merry Christmas From The Family" single is also rereleasing to radio this year. Can you comment on that? You can order my “No. 2 Live Dinner” vinyl on my website right now. Today, LP stores are few and far between. By the time I did this album, LPs were no longer in existence. They slowly crept back in. So what’s interesting about this album is that there has never been an LP for it before. There’s something about the ritual of putting the needle down on the record, sitting back, and listening to it. I make pizza! On Christmas Eve, I make the dough and then lay out all of the different toppings. I have a small family, two girls and my wife, but we’re really close. We make all the toppings ourselves. Occasionally, a neighbor or a friend drops by, and they pick what they want and then I make it for them. I usually make about 12-15 pizzas. And on Christmas, my wife makes lasagna! I guess our Christmas is Italian themed. I don’t really need anything, but I don’t say “don’t get me something” because people always end up doing it anyway. In general, I’m always happy to get guitar strings or something that has to do with what I do. I could use a nice pen…I have a lot of stuff, and I’m not really that materialistic. Is Christmas your favorite holiday? I’d have to say Halloween. That’s mainly because I have kids, and it’s a great time with costumes and candy, and it’s usually the first big blast of cold in the air. My oldest daughter recently graduated from college, and this year, she dressed up as the waitress from David Lynch’s “Twin Peaks” show.